What makes art so universal is the ability to tell a story. It’s a safe place for the artist to share something important. And it all starts with an idea. But what if that idea keeps on going and going and turns into something almost unrecognizable? 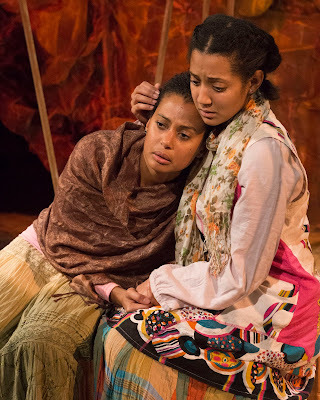 Such is the case in Antu Yacob’s Mourning Sun presented by Theatre 167. What begins as a fascinating cultural case study turns into an unfortunate romantic drama. With the first act set in Ethiopia and a second act set in New York, Mourning Sun follows young Biftu, a young Ethiopian girl, who fantasizes about American pop culture and Michael Jackson with her friend Abdi. But when Abdi leaves for America, Biftu is forced into an arranged marriage that not only breaks her soul but breaks her body. This portion of Yacob’s story is mesmerizing. It’s a horrid story of child brides forced into marriage and the aftermath of childbirth. But after a bizarre intermission position, the play takes a drastic turn where Biftu is brought to America by Abdi where a tumultuous and cliché love story appears. Yacob has everything going in her favor in the first act. There are certainly some questions that arise but they do not come close to the problems of Act II. The story within Act I is unique and something noteworthy. The questions in the first act may be a combination of textual and directorial. What prompts Abdi’s return to Ethiopia? And in four years, has Abdi really lost all semblance of his dialect? Especially when we discover that his aunt still has a hint of one. But then when we arrive in Act II, the woes that Yacob and director Ari Laura Kreith encounter alter all the momentum from the first act. With no room for exposition, we are thrust into the action of the unrest between husband and wife. We watch Biftu attempting to learn how to be an American while Abdi appears to regret his decision of marrying his former love. Rather than keep the conflict internal between two characters we’re familiar with, Yacob introduces love interests in the form of Abdi’s school and writing partner Kayleen and Abdi’s landlord True. This adds an unfortunate soap opera element to the story. It’s hard to care about the broken relationship when there is more time spent with Abdi and Kayleen and Biftu and True than Abdi and Biftu. It’s one thing transporting across continents but transporting it to a new genre and style was detrimental to the promise that Yacob truly has. Antu Yacob’s play is not easy, especially when it comes to how she crafted Biftu. Biftu is a strong, independent woman and required an equally strong actress to portray her. Arlene Chico-Lugo offers a performance to remember. Even with the woes of the second act, Chico-Lugo is able to fight through. Chico-Lugo has a slight resemblance to "Scandal" star Kerry Washington and just so happens to have a stage presence to match. Arlene Chico-Lugo is a name to remember. In dual roles, Fadoua Hanine easily proved her range. From the bubbly optimist Mawardi to the manipulative temptress Kayleen, Hanine was transformative. Though he mainly appeared in the second act, John P. Keller made his time worthwhile. As the sensitive stoner True, Keller avoided stereotype and created a character that was compassionate and generous. It would be easy to play True as someone who takes advantage of Biftu’s situation, but Keller allowed Biftu control, something that Biftu had never experienced. Though going commando may say otherwise. Kevin Hillocks struggled greatly as Adbi. He was at his best in his pre-America scenes but something drastically changed when his character made his way to the new continent. By Act II, Hillocks grappled finding truth with the groan-worthy dialogue his character spoke. From a production standpoint, Mourning Sun had some very high highs and some mighty low lows. The West End Theatre is a very specific space that has been converted into a performance space within a church. Rather than hiding the architecture of the space, they kept it visible, highlighting it sparingly. It didn’t detract from the production but the high ceilings and minimal set caused some monstrous echoes. It took some time to warm up to but certainly altered the quietness of the intimate moments. The structure created by scenic designer Jen Price Fick worked wonders in the space, especially when lighting designer Matthew Fick threw any color on it. The cohesiveness between the lights and the fabric is stunning. The other contribution Jen Price Fick offered were the advantageous structures that formed everything from doors to walls to buses. They may not be aesthetically pleasing but the structures sure did the trick. Director Ari Laura Kreith kept the piece moving from scene to scene. With a hefty amount of scenic shifts, sound designer Travis Wright would change up the scene changes with accompanying environmental sounds and music. Those moments when it wasn’t present was unfortunate. Kreith’s staging was a blend of realistic and theatrical. The moments of theatricality are interesting except for breaking out for the sake of breaking out, especially during Abdi’s monologue. Regardless, Kreith’s focus was telling a story and she did solid work in storytelling no matter what the script threw at her. Mourning Sun will be a very important play once Antu Yacob does some necessary work. As it stands, Act II needs an immense amount of help. If Yacob can find a way to match the power her first act has, Mourning Sun will have a long life on stage. Maybe even beyond.